What could they mean, these mysterious 34 letters and numbers hanging between the trees along the Herengracht? At first sight, the installation looks like the illuminated decoration we know from shopping streets in the wintertime but it’s definitely not. Are you curious how you can pay with bitcoins? Allways wanted to support a good cause? You can easiy donate to Huis van de Tijd, a foundation for elderly people with dementia. With all donations we offer the residents of Huis van de Tijd a tour by boat during Amsterdam Light Festival. Hint: the artwork is located in front of the appropriately named former bank building The Bank and the words ‘on the … [bank]’ are hidden in the series – Frederike Top’s 'Code' refers to the address of a real online wallet, in which digital money (cryptocurrency) has been stored. You could regard this address as a recent addition to various codes, the important ‘languages’ of our digital age. For example, the texts, images and sounds on our computers, phones and tablets are converted into specific codes, or bits, that are sent in packages via cables or radio waves. The technology used for cryptocurrency, such as the well-known bitcoin, the blockchain, is also part of our modern programming languages. Blockchains, or chains of data that have been merged into ‘blocks’, have ensured that digital currency transactions are transparent and cannot be manipulated. Central control is no longer needed for digital transactions as opposed to the traditional financial world. Cryptocurrency is a real threat for governments and banks as Top highlights in her installation by positioning it in front of the enormous, ‘closed’ former bank building. Top deliberately wrote 'Code', a sequel to her series of poetic 'Street Sentences' in the streets of Amsterdam, in an ‘old fashioned’ manuscript. The oldest form of writing in the world, the cuneiform script, was published around 3000 BC. It was invented in Mesopotamia to record property, contracts and transactions, very similar to the blockchain today. And in the same way that society was able to advance with the arrival of the script, the blockchain has the potential to radically change our world. Dutch artist Frederike Top (1981) studied 3D Design at the HKU in Utrecht and has since been working in Amsterdam as a product designer. 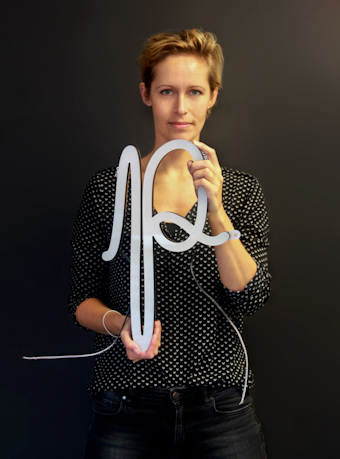 In her design studio, she creates, among other things, lamps and furniture for interiors and public space. By means of small interventions that are actually large gestures, Top attempts to introduce a little poetry into the environments for which she designs. Her work often has a playful character and invites user interaction in some form.